I had been anxiously awaiting the opening of Lumière Chef Michael Levitan’s new restaurant “concept,” Area Four. Never having ventured to the Chef’s “project”, Persephone, during its single year of service to hungry hipsters and haute-couturists, I had nothing to gauge the potential success of the Leviton-Krupps partnership. Taking its name from that technological epicenter between Kendall and Central Squares in which it resides, Area Four strives to be all things to all people. On paper, the idea of basing a restaurant around both a bakery/café and a bar/oven seemed intriguing, like a high bow, new-age Cheers for Cambridge denizens and the scientific intelligentsia. When I first arrived and saw the space, with its straight steel supports and large, all-encompassing windows, I tried to shake off the trappings of my humble liberal arts education and take on an MIT state of mind. But the down-to-earth hostess and waiters were clad in colorful and all-together random tee shirts, their demeanor devoid of stark professionalism. The bakery was tucked away; the majority of the space belonged to the bar/oven side of the restaurant, which was lined with logs. Tables were wooden, but still industrial looking. Parties shared menus that featured just a few entrées, a pizza list, and a long list of items labeled “cold” or “hot.” The space was industrious but warm, streamlined but casual. The restaurant opened to turn out pizzas from the wood oven, but appetizers dominated the menu. Was this supposed to be a small plates restaurant? Confusion aside, we started off with only one “cold” option, the A4 Mozzarella, Smoked Tomato, Spicy Fennel-Garlic Vinaigrette($6.50), which turned out to be the highlight of the meal. The two small slabs of housemade mozz featured the perfect balance of stringy and creamy, with a taste that was fresh, milky, and sweet. The tomato-fennel topper was spicy, as advertised, but warm and well-rounded. It really woke up the palate when paired with the rich cheese. 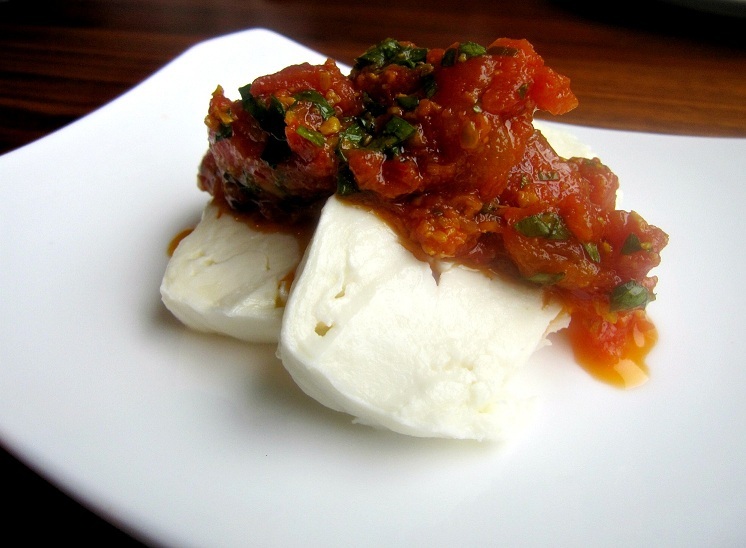 The meatiness of the tomatoes and the punch of fennel seed made the dish seem light, but somehow beefy. New singers of the vegetarian gospel would probably find comfort in this little dish. 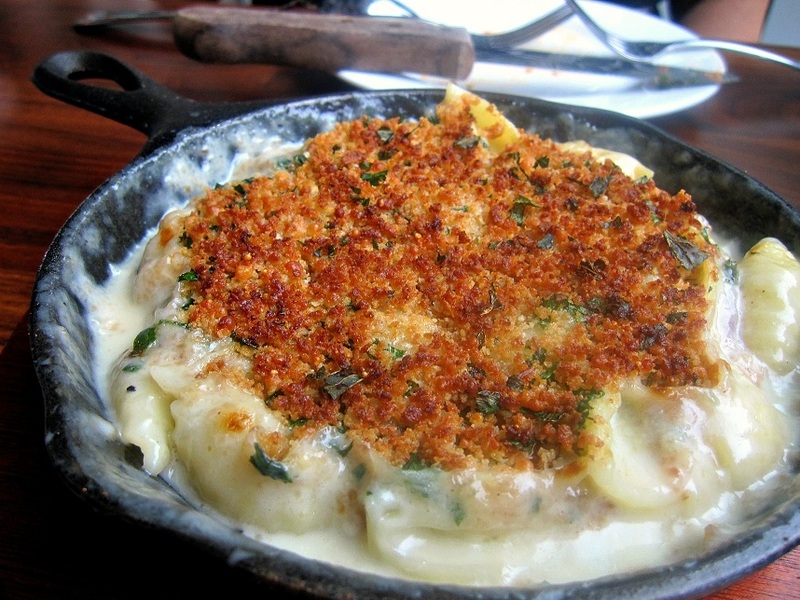 Our “hot” dish, the Mac & Cheese with Croissant Crunch Topping ($11), which stayed piping hot in a personal sized cast iron skillet, could have easily been a main. Luxurious cheese sauce clung lovingly onto perfectly cooked pasta shells, their wide ridges facilitating the process. Sadly though, the sauce that swam among the coated shells had big cheese flavor but the consistency of running water. The croissant crumbs, though, almost made us ignore this huge infraction. Their crisp crunch and ultra-buttery flavor somehow made this classic comfort food more, well, comforting. Passing on pizza, which looked as if it lacked the char and chew I crave from a thin crust pie, I ordered something else from the wood oven: the Roasted Chicken ($14). Yes, I know, chicken. 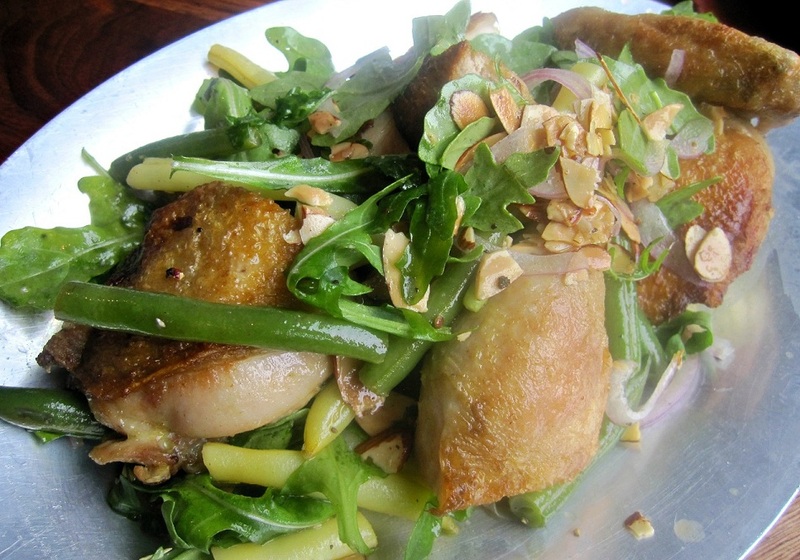 The presentation was beautiful: pieces of the half chicken were served atop a bread salad, consisting of hearty wheat croutons, fresh summer green beans, partially wilted arugula, paper-thin slices of red onion, and crunchy toasted almonds. Between the crisp (thank god) skin that I find requisite of roasted bird and the salad, this was a textural masterpiece. Sadly, though, it lacked in flavor. The wood-fired oven certainly did not impart any flavor. The promoted lemon and herbs somehow missed my serving; the salad was soaked only in olive oil, chicken jus, and salt (a saving grace). But a sweet ending is a happy one. I should probably confess my number one reason for visiting Area Four: SOFT SERVE ICE CREAM. 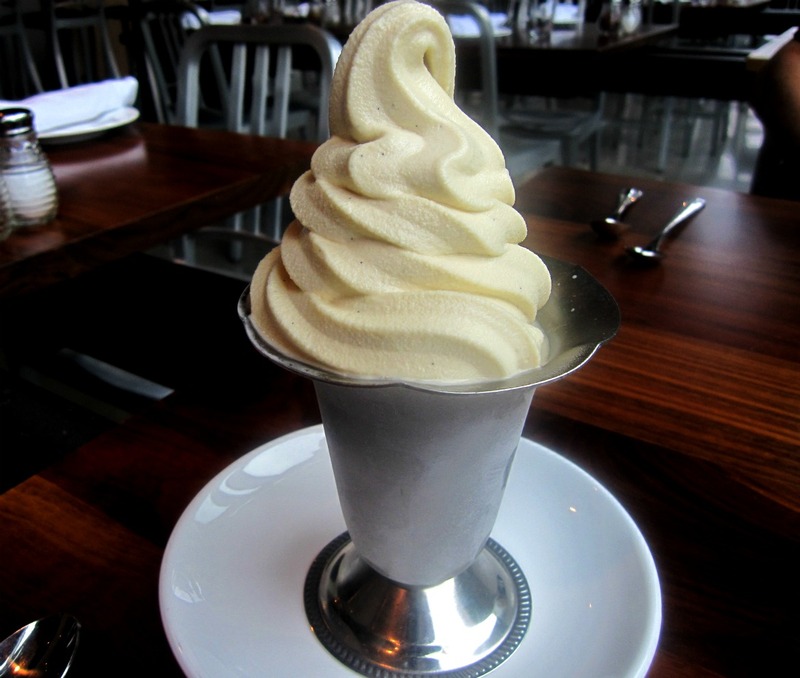 As one who loves making ice cream at home but consumes more off the dasher than from the freezer, I was psyched to order a dish of vanilla soft serve ($6) straight up. Vanilla beans are flecked throughout, but a high-quality Bourbon extract is most likely used as well, for there is a noticeable butterscotch taste. I almost cried when I tried this über-rich version, having stayed away from the childhood favorite for years due to its chemical-laden base. Vanilla is offered along with a flavor of the day or a twist (!) of the two in a dish or as part of a sundae. You can also seal the deal with homemade toppings like salted caramel, candied nuts, cookie crumbles, and crimson berry sauce. Not to be easily upstaged, though, was the Honey Panna Cotta ($8). It was ordered as an afterthought, but it turned out to be the most memorable restaurant dessert I have had as of late. The honey added a pleasant, heady floral note to the dish without being overly perfumey. A compote of blueberries and blackberries was so lightly sweetened and barely broken down; each berry maintained its integrity. 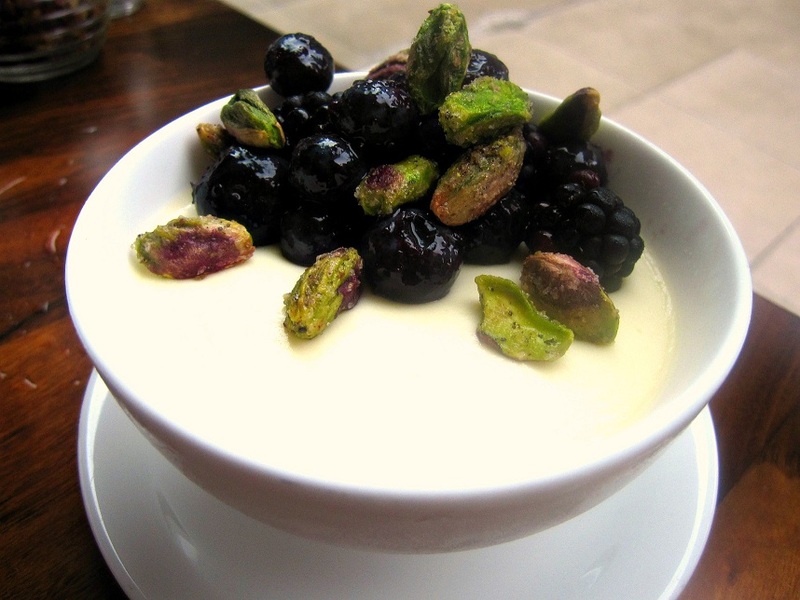 Candied pistachios were pleasantly salty and savory, adding texture to this very creamy dessert. So, when does innovative become ordinary? A glance at the bakery case didn’t even tempt me to bring something home; it was bare by 3pm, with only a few dry-looking breakfast pastries and overly browned cookies to be found. One small plate was ingenious; the other was good but done so much better at countless other restaurants. The main dish had creative components but was not executed to its full potential. Desserts seem to be where Area Four excels – surprising, given that very unwelcoming case of baked goods. Perhaps a slice of pizza might change my mind, because I will be back. I’m rooting for this place. Plus, there’s a chocolate olive oil cake on the menu that has my name on it. The chocolate olive oil cake is worth going back for. The salted caramel sauce is not as salty as I’d like but it’s good. I went to Area Four a few times when I worked next door. I also was not really tempted by anything in the bakery case… lots of overbaked cookies, but I did enjoy that mozzarella dish as well as a wheatberry and veggie salad. And I think using old croissants for mac and cheese topping is ingenious!